The POSCO steel plant and port planned in Odisha’s Jagatsinghpur district have run into fresh trouble. An expert appraisal committee (EAC) of the Union Ministry of Environment and Forests deferred its decision on clearing the port project, saying the South Korean steel giant did not furnish sufficient details. The company had submitted the detailed Environmental Impact Assessment (EIA) of the port near Paradip to the EAC that examines projects in coastal areas, on October 18. The port will be used exclusively for importing coal and iron ore for the plant and exporting steel. The company was unable to furnish details of how the steel plant would impact the coast; the plant may discharge effluents into the sea. “The company is not sure whether theirs will be a zero-discharge facility. If there are plans to discharge effluents along the coast, it will put a question mark on the clearance granted in 2007,” an EAC member said on condition of anonymity. The ministry had granted environmental clearance to the POSCO steel plant on the basis of a rapid EIA in 2007 (see ‘Ups and downs’). POSCO India’s spokesperson said the company will wait for the final decision before making any comments. The port EIA has a number of shortcomings. According to an analysis by the Centre for Science and Environment (CSE), a non-profit in Delhi, the EIA fails to address a number of impact parameters. Cumulative impact of the captive port, Paradip port and the under-construction Dhamra port; economic impact on the fishing community; impact on Olive Ridley turtles; and impact of ship movement on the ecology of the area are a few of them. “The comprehensive EIA is not sufficient to make an informed judgement or decision,” said Chandra Bhushan, deputy director of CSE. 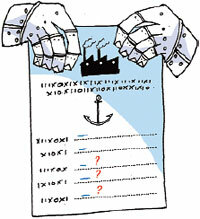 Paradip and Dhamra are within 40 km of the proposed port; their cumulative impact needs to be assessed before clearance. The EIA also does not account for the established and proposed industries in the area like the Indian Oil Corporation refinery and Essar steel. The EAC member said POSCO claimed it has studied cumulative impact of all three ports and would submit it at the EAC meeting in January. POSCO also claims to have addressed concerns relating to turtle and crab nesting sites and the impact of increased ship movement in meetings with state-level committees. “Those details have been sought from them,” the EAC member said. Odisha has three Oilve Ridley nesting sites—Gahirmatha and the mouths of the rivers Devi and Rishikulya. These are mass-nesting or arribada sites. Gahirmatha, a marine sanctuary, is between Dhamra and Paradip ports. Odisha coast is also a known nesting site of the horseshoe crab. The EIA does not have details in relation to the period of nesting and specific nesting sites. The EAC member pointed out that since the steel plant and port project are interrelated, it would make more sense to conduct an integrated EIA than two stand-alone ones. POSCO proposes to use some of the earth dredged from the port site for reclaiming land at the steel plant site. “The company is essentially looking for phase-wise approval which is not right and then there are site-related issues that need to be addressed before taking a final decision on the project,” the EAC member said. The EIA report also says that dredging will destroy marine habitat and some fragile organisms that live close to the sea floor. 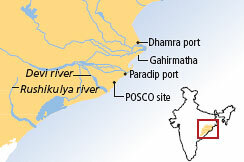 The port is proposed at the Jatadharmohan creek. Drastic changes in the creek caused by dredging and the likely effluent discharge from the plant are bound to affect fish catch and in turn the fishing communities in the area. Earlier, members of a review committee of the ministry had pointed out violation of the Forest Rights Act at the steel plant site (see ‘POSCO review body divided’, Down To Earth, November 1-15). The project is stalled as of now.